In a large bowl, combine the bread crumbs, salt, pepper and eggs; crumble beef over top and mix well. Add onion and half of the tomato sauce. Press into a 9x5-in. loaf pan. Bake at 350° for 50 minutes. In a saucepan, combine the sugars, vinegar, mustard and remaining tomato sauce; bring to a boil. Pour over meat loaf; bake until no pink remains and a thermometer reads 160°, about 10 minutes longer. Freeze option: Securely wrap and freeze cooled meat loaf in plastic wrap and foil. To use, partially thaw in refrigerator overnight. Unwrap meat loaf; reheat on a greased 15x10x1-in. baking pan in a preheated 350° oven until heated through and a thermometer inserted in center reads 165°. 1 slice: 419 calories, 17g fat (6g saturated fat), 146mg cholesterol, 969mg sodium, 38g carbohydrate (23g sugars, 1g fiber), 28g protein. Lomo saltado, the Peruvian beef, onion and tomato stir-fry of Chinese influence, often uses pricey beef tenderloin. We preferred sirloin tips (also called flap meat) for their meatier flavor and lower price. A whole jalapeño sliced into thin rounds provides subtle heat here; if you prefer little to no spiciness, halve and seed the chili before slicing it into half rings. Classic lomo saltado is served over french fries to soak up the juices; steamed rice is a simpler accompaniment. Once cooking begins, things move along quickly, so have all ingredients prepared and a serving platter nearby. Toasted cumin seeds added both earthy flavor and crunchy texture. Breaking some of the chilies in half released the seeds, giving the dish assertive spice; leave the chilies whole for a milder version. We also loved this dish made with 1½ pounds of lamb leg or shoulder, trimmed and thinly sliced (freeze the lamb for about 30 minutes before slicing). The chili pods are edible, but we ate around them. Serve with steamed white rice. 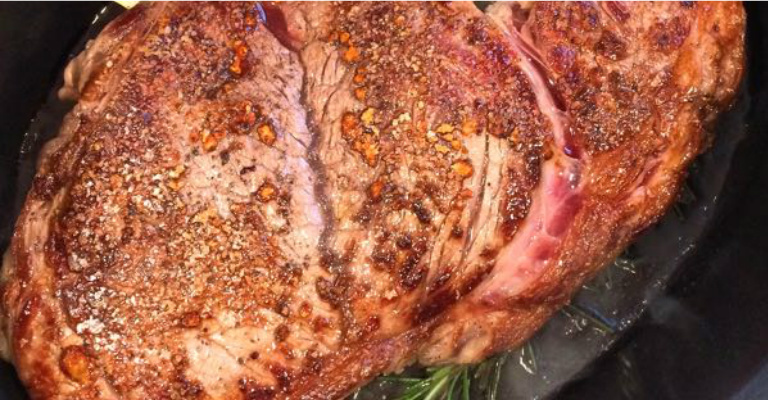 Brush the steaks with one tablespoon of olive oil, then coat with the crushed peppercorns on all sides. In a large sauté pan big enough to hold all the steaks at once, heat the oil over medium high heat until it starts to sizzle. 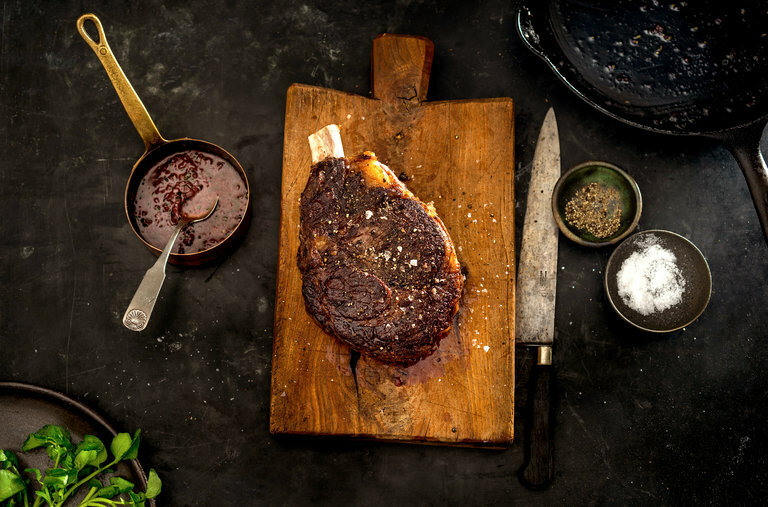 For steaks cut 1 to 1 ½ inches thick, four minutes per side will give you a medium rare steak. If you prefer your steak medium, increase the cooking time to a total of six minutes per side. Add the steaks to the hot oil and reduce the heat to medium. When you cook the steaks do not move them around the pan. Let them sit on one side until it is time to turn them. In the last two minutes of cooking, add the softened butter to the pan and using a spoon, braise the steaks with the melted butter by gently poring it over the steaks for the remaining cooking time. Allow steak to rest for at least three minutes before you serve them this way the juices will redistribute inside the meat and the steak will be much juicier. If you serve it right away, the juices will come running out when you first cut into the steak. 1 Cook noodles as directed on package; drain and cover to keep warm. 2 Meanwhile, in 10-inch skillet, cook ground beef over medium-high heat 5 minutes, stirring frequently; drain. Stir in garlic. 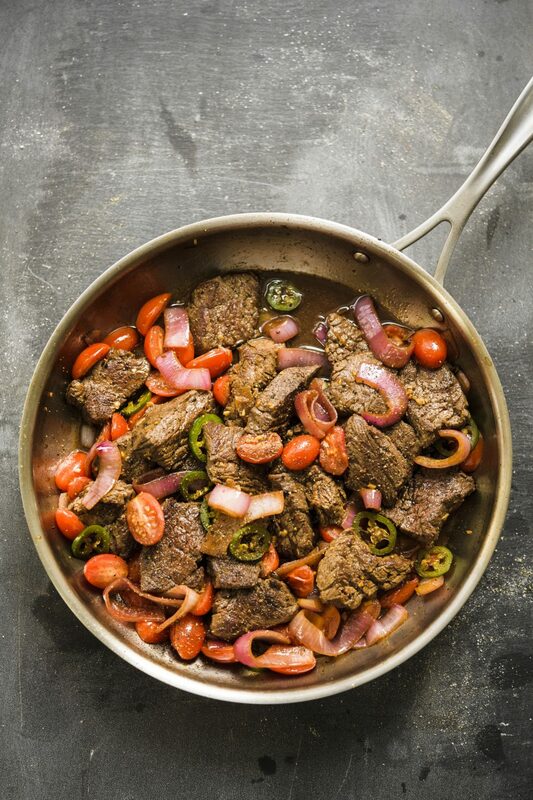 Reduce heat to medium; cook 1 to 2 minutes, stirring occasionally, until beef is thoroughly cooked. 3 Reduce heat to medium-low. Stir in cheese and milk. Cook 5 to 6 minutes, stirring frequently, until mixture is thoroughly heated. 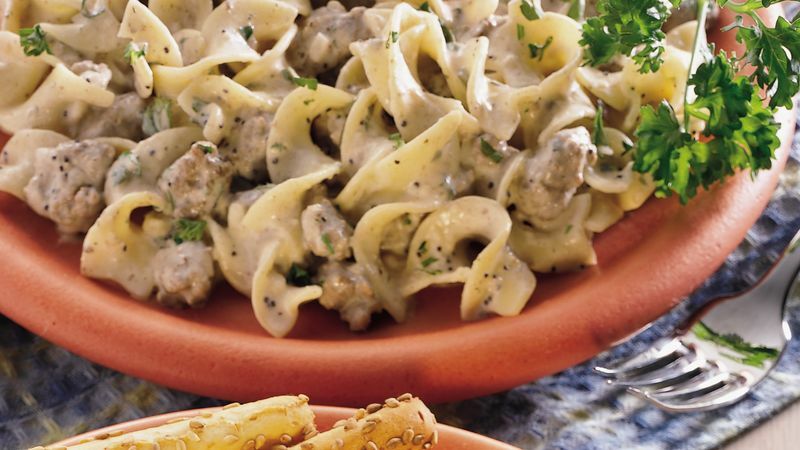 Stir in sour cream, cooked noodles, parsley and poppy seed. Cook 1 to 2 minutes, stirring frequently, until mixture is thoroughly heated. Meat and potatoes -- those are the leading ingredients in this country delight. Much like shepherd's pie, this recipe uses a different take with a similar taste. Brown beef in 1 tbsp. butter in skillet; add the salt and pepper; set aside. Cut baked potatoes in half lengthwise and scoop out pulp into large bowl. Mash and add remaining butter and the milk. Beat well and add beef and remaining ingredients, except cheese. Fill shells with the mixture and put on baking sheet. Top each with a half slice of cheese and bake in hot oven, 400 degrees, about 15 minutes. Place trimmed brisket into a large baking pan. Mix ketchup with onion soup mix. Add 1 cup of water or more to make it slightly thin. Pour sauce over the meat, cover pan with foil, and marinate 12 to 24 hours in the fridge. Place covered pan into a 275-degree oven and walk away for 6 to 8 hours, depending on how large the brisket is. Check tenderness when brisket has been cooking several hours: stick in two forks and pull in opposite directions. Meat should come apart easily. When meat is done, remove from oven and place on a cutting board. Slice against the grain; don’t be disturbed if meat totally falls apart! That means it’s good. Serve this brisket with mashed potatoes and steamed veggies. Either return the sliced meat to the sauce until serving, or place meat on a platter and spoon sauce over the top. Serve with a kosher-for-passover noodle kugel! 1. Cook bacon in large skillet over medium-high heat until crisp. Using slotted spoon, transfer bacon to paper towel-lined plate and refrigerate. Pour half of bacon fat into small bowl; set skillet with remaining bacon fat aside. 2. Dry beef thoroughly with paper towels. Season beef with salt and pepper; place half of beef in slow cooker. Heat skillet containing remaining bacon fat over medium-high heat until just smoking. Cook remaining beef in single layer until deep brown on all sides, about 8 minutes. Transfer browned beef to slow cooker. 3. Add reserved bacon fat to now-empty skillet and heat over medium-high heat until shimmering. Add onion, carrots, and 1/4 teaspoon salt and cook until vegetables begin to brown, about 5 minutes. Add garlic and thyme and cook until fragrant, about 30 seconds. Add tomato paste and stir until beginning to brown, about 45 seconds. Transfer mixture to slow cooker. Stir bay leaves and tapioca into slow cooker. Set slow cooker on LOW, cover, and cook until meat is fork-tender, 8- 9 hours. 5. Meanwhile, about a 1/2 an hour before the stew is done cooking, bring frozen pearl onions, unsalted butter, sugar and water to boil in large skillet over high heat. Cover and simmer over medium-low heat until onions are tender, about 5 minutes. Uncover, increase heat to high, and cook until liquid evaporates, about 3 minutes. Add mushrooms, and 1/4 tsp. salt and cook until vegetables are browned and glazed, about 5 minutes. Stir the onions and mushrooms into the stew. 6. Discard bay leaves and stir in reserved bacon. Bring remaining 1 cup wine to boil in large skillet over high heat and simmer until reduced by half, about 5 minutes. Stir reduced wine and parsley into stew and adjust seasonings. Serve over buttered egg noodles. Bon Appetit! Cook's Note: Make sure to use the LOW setting on your slow cooker; the stew will burn on the HIGH setting. 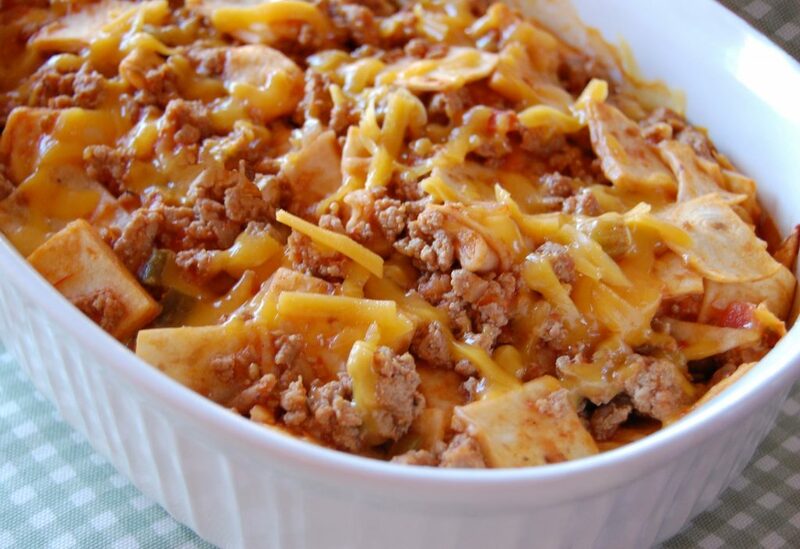 "Makes an easy weeknight meal for busy families. You'll have dinner on the table in 30 minutes!!" 2. In a large skillet over medium heat, cook the ground beef until browned. Drain off excess grease. 3. Stir in tomato soup, salsa, milk, tortillas cut into 1 inch pieces, and half of the cheese. Spoon mixture into a greased 2-quart shallow baking dish and cover with foil. 4. Bake for 30 minutes. Sprinkle with remaining cheese. Pasta noodles, filled with meat, cheese and veggies, topped with pasta sauce, mozzarella cheese and fresh basil. Individual portions, perfect for serving family and friends! 1. 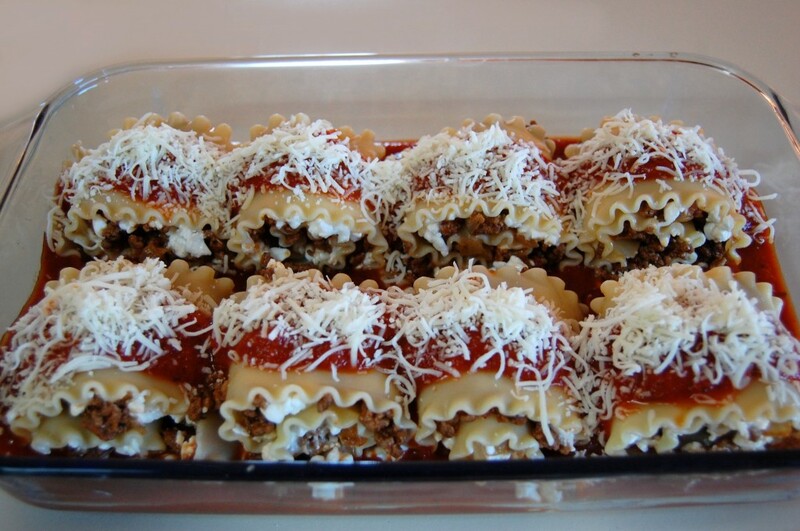 Cook lasagna noodles 8 to 10 minutes or according to package directions, until al dente. Drain; rinse under cold water to stop the cooking. Arrange cooked noodles on sheets of waxed or parchment paper. Pat dry, if needed. 2. Meanwhile in a large skillet, heat olive oil over medium heat. Add garlic and onions and sauté for 2-3 minutes. Add ground meat and brown. Drain off excess fat. Add 1 cup spaghetti sauce and Italian seasoning, stir to combine; reduce heat to medium low. Simmer for about 5-10 minutes. 3. Spread 2 cups of spaghetti sauce in bottom of a 13 x 9-inch baking dish or pan. 4. In a large bowl, combine cottage cheese and 1 cup mozzarella cheese together. 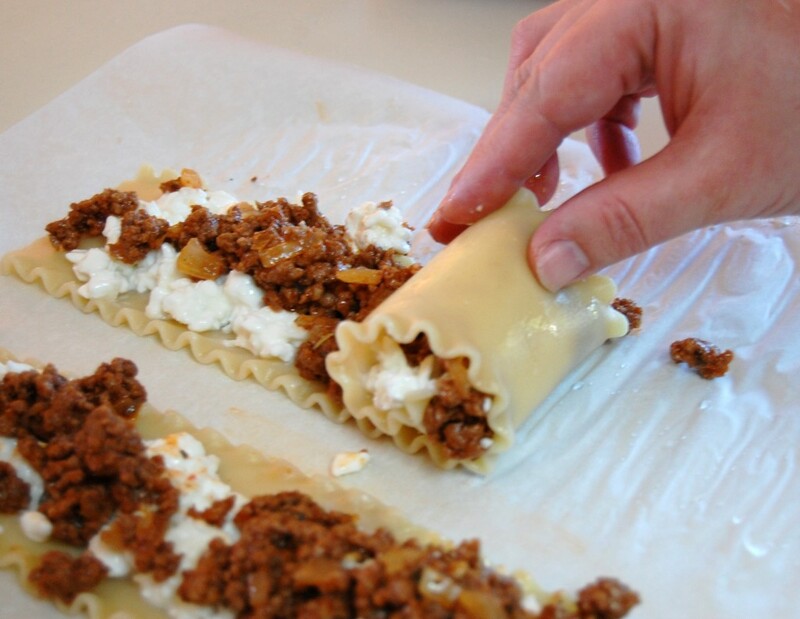 Evenly spread the cheese mixture and meat sauce down the center of each lasagna noodle. Roll up, jelly-roll style; place seam-side down in dish. Spoon remaining 1 cup spaghetti sauce over rolls and sprinkle with remaining 1 cup mozzarella cheese. 5. Loosely cover dish with foil and bake in a preheated 375 degree oven for 35-40 minutes or until hot and bubbly and the cheese is melted. Garnish with basil, if desired. Serve with a green salad and crusty French bread. Cook's Note: I like to cook a few extra lasagna noodles in case they tear. Sautéed mushrooms, green pepper or celery would be a great addition to the meat filling. If you like heat, add a pinch of red pepper flakes. In a 4 to 6-quart slow cooker, combine steak, mushrooms, onion, celery, and garlic. In a medium bowl, combine tomatoes, tomato sauce, ½ cup water, gravy mix, salt, and pepper. Pour over steak mixture. Cover and cook on LOW for 8 to 10 hours. Serve over mashed potatoes with a mixed green salad. Quick Tip: You can use canned tomatoes for this recipe but sometimes you might like to use salsa. “For this crowd-pleasing appetizer, all you have to do is mix together flavorings with prepared frozen meatballs and let the slow cooker do all the cooking! Place all ingredients in slow cooker; stir gently then cover with lid. Cook on low setting for 7 to 8 hours, or on high setting for 4 to 5 hours, until done. Quick Tip: Turn these slow cooker appetizer meatballs into a meal by adding rice to the mix. ½ Cup of Ketchup substitute more mustard and increase sugar*. Mix together the ingredients and pour over the meatballs. Bake 350 degrees for about 1 hour. This is cooked in slow cooker, which makes the meat absorb the flavors more. 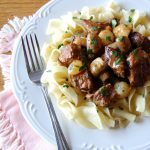 Slow cooker also makes this super tender, a quality we all love in our meat dishes. 1. Take the beef roast out of the refrigerator and let come to room temperature by sitting on the counter 10-15 minutes. 2. Sprinkle roast evenly with 3 teaspoons kosher salt and all of the pepper. 3. Heat a Dutch oven or large pan over high heat (or insert of Slow Cooker with Stove Top Browning) then add olive oil. 4. Sear beef roast on all sides, rotating every 3-4 minutes, so that it forms a golden brown crust on all sides. Remove from pan and place in slow cooker if you didn’t use the stove-top-safe slow cooker insert. 5. Add all remaining ingredients to the slow cooker: garlic, rosemary, celery, carrots, tomatoes, beef broth, wine and remaining 2 teaspoons of kosher salt. 6. Heat on Low for 8 Hours. 7. To serve, remove beef from slow cooker and let rest 10 minutes. Shred with fork or slice against the grain. Serve with vegetables on the side and fresh parsley. 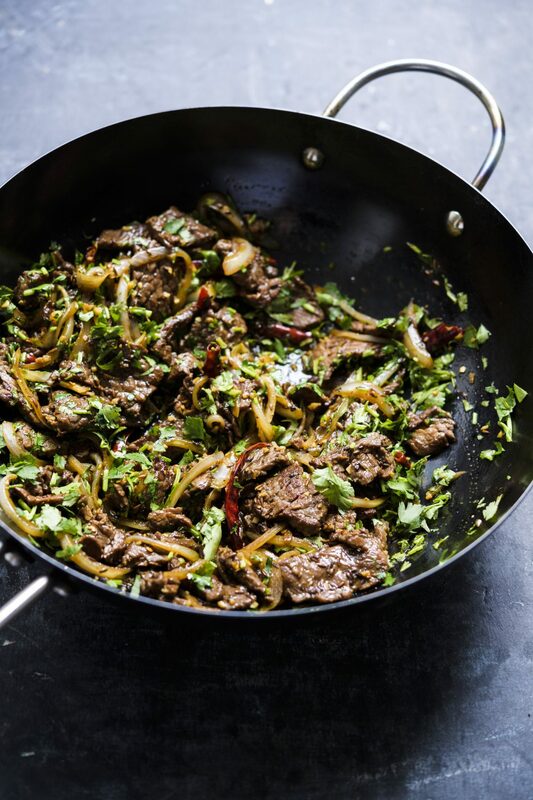 There are few faster, easier and more impressive ways to get dinner on the table than to sauté a juicy steak over a hot flame, then whisking together a sauce from the coppery drippings at the bottom of the pan. Although the technique for making pan sauce is used here with beef, it is easily adaptable to all sorts of meats, including pork, lamb, chicken, veal and even fish. A proper pan sauce begins with browning the meat. The pan needs to be hot enough to sear the meat and cause the Maillard reaction, which is the caramelizing of the amino acids and sugars in food. After the meat is cooked to taste, it is removed from the pan, leaving behind a seared-on layer of browned bits called the fond. The fond is culinary gold, containing an incredible savory character that forms the foundation of the sauce. To access that meaty flavor, the fond needs to be dissolved into a liquid; this is called deglazing the pan. Technically, any liquid can be used, and water and stock frequently are. But something alcoholic and acidic, such as wine, is better at extracting the flavors. A classic method of building a pan sauce, which we use here, is to develop the flavors in stages. First, brandy is used to deglaze the pan, then wine and stock are added and simmered down until syrupy. At the very end, butter is whisked into the pan to thicken the sauce, giving it a silky texture that helps it cling to the steak for serving. Other liquids can stand in for the brandy, wine and stock: fruit and vegetable juices, cream or milk, condiments like soy sauce and chile paste, vinegars and spirits. Once you’ve learned this adaptable technique, you will always be able to whisk up a fast and pungent pan sauce from whatever fond your pan has produced. 1. Cut round steak across the grain into very thin strips. 2. Sprinkle with paprika and set aside 5-10 minutes. 3. Cook rice. In the meantime, melt butter in a large skillet over medium-high heat. Add steak and brown well on both sides. 4. 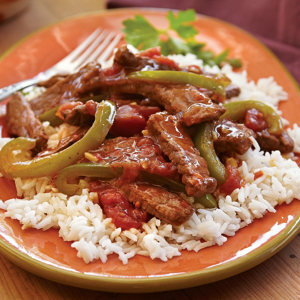 Push steak to sides of skillet and add bell pepper and garlic, stir-fry 3-4 minutes. 5. Then stir in tomatoes and broth. Bring to boil. 6. Cover, reduce heat to low and simmer 15 minutes. 7. Combine 1/3 cup of water, cornstarch and soy sauce in a small bowl. 8. Stir mixture into skillet and cook 1-2 minutes until thickened slightly. 9. Serve beef mixture over hot rice. 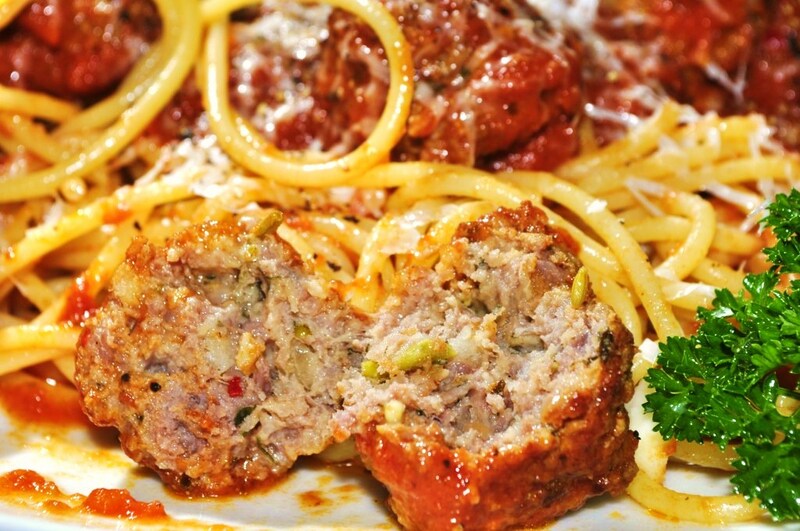 To make meatballs, combine all meatball ingredients and mix well. Shape into small balls and chill for 30 minutes. Gather 4 tablespoons parsley, bay leaves, and peppercorns in a cheesecloth bundle. Tie to secure. After chilling, heat olive oil over medium-low heat in a heavy pot. Briefly brown meatballs, then remove to a plate. To pot, add beef stock, water, salt, tomato paste, and herb bag. Bring to a boil, then simmer 30 minutes. Add onion, carrots, celery, and potatoes. Simmer 15 more minutes. Remove herb bag. Add cabbage and meatballs + handful of chopped fresh basil. Bring to a boil, then simmer 8 to 10 minutes. Serve with plenty of freshly grated Parmesan cheese sprinkled over the top. Now squish everything together with your hands until it’s all mixed. Pour some olive oil into a skillet and heat it over a medium flame. As it comes to heat, start molding the meat into balls of a size you are comfortable with. Fry them in batches in the hot oil, turn them so as to brown them all over, or as best as you can. When browned, set them aside on paper towels to drain. They will finish cooking in whatever sauce you use so don’t worry if they are a bit pink in the middle. A quick tip, cookie scoops make meatball production easier and quick. This is a DOUBLE recipe that makes 8 to 10 subs, you can easily halve the ingredients or you can freeze extra meatballs and sauce for later. Mix all ingredients together and mix well. You’re going make 1 ½ inch balls. The easiest way to do this is to use a cookie/muffin scoop (see photo above). Place on the baking sheet and bake at 350° for 15-20 minutes. Don’t overcook, as they will finish in the sauce. 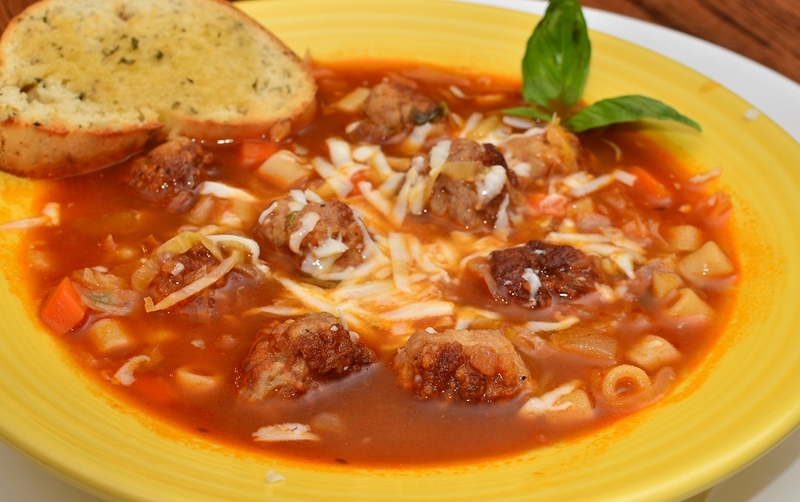 *For spicier meatballs you can substitute 1/4 to 1/2 of the ground beef with spicy Italian sausage. In large saucepan or dutch oven, add ingredients, bring to a low boil, reduce heat to low, cover and let simmer for 15 minutes, stirring occasionally. Add meatballs and stir gently. Let simmer for 10 minutes or longer. Slice rolls, but DO NOT slice completely in half. Place 4 to 6 meatballs in each roll, add lots of sauce, sprinkle with Parmesan and top with slices of mozzarella. Place on baking sheet, cheese side up and bake at 375° for 15 to 20 minutes, until cheese is melted and bread is toasty. Keep a good eye on it, they will burn quickly. Serve with lots of napkins. NOTE: My mom has this trick of slicing out a wedge on the top of the rolls (instead of slicing them in half lengthwise) to make the pocket (see photo at top). Then they actually sit on their natural flat bottoms while baking. This has the added advantage of creating instant breadsticks from what is cut out that you can brush with olive oil and garlic and bake.